Today we have an interview with the man, they myth, the legend Mr. J! 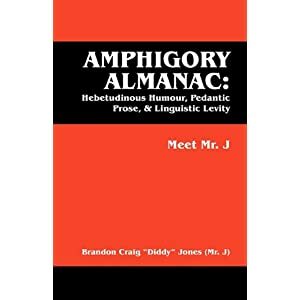 No, not Mr. J from Americas Next Top Model, but the other Mr. J. Yeah, that’s right…the author of “Amphigory Almanac: Hebetudinous Humour, Pedantic Prose, & Linguistic Levit: Meet Mr. J”. I simply call it Meet Mr. J, its easier to remember and a hell of a lot easier to say. Let the fun begin, shall we? Who is Mr. J? I mean, does the J stand for something or do you prefer to remain anonymous? I understand if you don’t want your celebrity status to interrupt your daily going-ons. -Mr.J is either the fake author of a real book or the real author of a fake book. -Broken down it’s: Three syllable sounds, two lowercase letters, and one witty writer. -It’s an acronym of “Mostly Ridiculous Jokes”. -I don’t need a pseudonym to keep me from being a famous face in the writer world, my lack of talent as an author has that covered. I’m so unrecognizable that even my driver’s license photo is just a picture of a superimposed question mark stamped over a faceless silhouette. Upon reading your book, the only conclusions I can draw are that you are either schizophrenic, or have an identity complex. Which of these terms can you relate to more? -I don’t have schizophrenia, one of my alter personalities does. -I have multiple personalities, unfortunately, they’re all boring, dull, or both so it’s hard to chose which to be which has lead to my identity complex. I’m not sure which real me to pretend to be or which fake me I really am. -It all started when my identity was stolen then the thief realized who I was and returned it immediately along with several others to chose from. Since then, to me, books on ‘self help’ seem identical to books on ‘helping others’. The book took me twice as long to read than it normally would of, I had to look every third word up in a dictionary. Do you consider yourself to be a wordsmith, and do you talk like this in normal conversation? -The word choice can be confusing like a colour blind kid trying to solve the Rubik’s Cube, like Stevie Wonder trying to parallel park, or like an Amish elder trying to get a job at Radio Shack. -Unfortunately I do talk like this: And people just stare at me like I’m a lava lamp, like I owe them money, or like I’m a French Menu. -I find too many polysyllabic words in a row is boring and causes people to zone out, even my tape recorder gets to a point where it just pretends to listen. Every time: I press record and it yawns. I press rewind and it tries to remember what the last big word I said was. And then finally when I press play, it pretends to run out of batteries. Would you consider yourself to be an intelligent man? Do you feel you’re smarter than the general public and this is why you have to use such a profound vocabulary? -Joking aside (which is to the left side of my superior intelligence and to the right side of the general public shame of their own stupidity/envy of someone else’s intelligence and by ‘someone else’ I mean ‘me’, for all you dumb dumbs out there…but joking aside) I don’t think laughter and learning should be segregated like church and state. And amalgamating vaudeville and vernacular acts as the midwife that births brilliantly infested excerpts of ebullient, erudite, & esoteric entertainment.Am I taller all of a sudden? Nope it’s this soap box underneath my feet, sorry to pompously pretentiously and pedantic parade precipitous pontifications in homage of Hamlet’s hebetudinously humorous Pollonius that took longer to get to the point than the earlobes of Spock. -So yeah, I used to be a narcissistic, megalomaniac, snobbish word-nerd that has been arrogantly self absorbed since I was born, even before that. For example: My sonogram looked like twins but was an illusion because it was a picture of me looking at the genius trapped in my handheld window which the dumber general public still argue was my own reflection in my handheld mirror, either way I’m a winner, an only child and a winner or a twin separated at birth from my identical brother who I assume looks like a winner. -And according to the dumber general public or the public that’s dumber in general, I’m still self involved these days. Example: Recently I failed Astronomy 101 even though I’m smarter than the general public simply due to the small fact that I thought the world literally revolved around me and my brilliance. -Well, I had home school…So yes. But since I’m an alumnus of Mr.J Academy, I won’t see any of my classmates till my 10 year reunion…aka: Next decade when I look into the mirror and remember how snow days were never canceled and for some reason still held a brief roll call of attendance for the entire student body that consisted of one student, one body, and less than one which if my math is right would be roughly zero or so, when it comes to counting the entire student body’s accumulated total of absences: Since staying home sick meant going to school sick. There are at least 1.2 million different characters in your stories, are they based on real people or do you make most of them up? 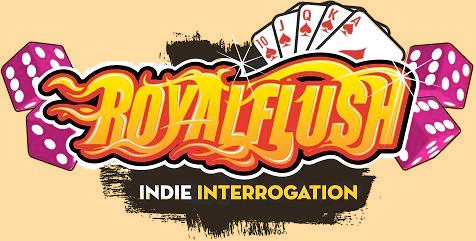 Do you take real life experiences and turn them into short stories? – I can’t say really. I’m not sure if it’s life imitating art imitating or if it’s art imitating life, but I can say that regardless, either way, I’m sure they’re both imitating an sh*tty book…and an imitation of an imitation is an original, sh*tty, but original. Do you write short stories because you have ADD and can’t focus on one thing for too long? Don’t feel bad, I enjoyed reading all of the stories, and feel if it was just one story I would of been bored out of my mind anyways. -Yes, I have A.D…Hey what’s that? -My book is so ADD that the book mark is a set of shiny keys. -And yeah if it was one long story it would be so exuberantly excruciating for the reader that it should come with a tub & toaster, chair & rope, or razor & note. I found your book to become somewhat addicting, as much as I wanted to putit down…and trust me I really wanted to put it down I just couldn’t do it. I wanted to get to the next story, and the next story, and so on. Did you expect this type of reaction or am I the only one to have this reaction? -You’re the only one who’s read it so I’m not sure. I still haven’t read it. It was hard enough to write a novel, to read one too would be too much. -I assume readers would want to get to the next story in hopes of it being better than the one they’re currently reading, which of course it isn’t. I’m thinking to changing the title to “Screw me out of 12 bucks”. -People often think I was on drugs writing it, so it makes sense that it’s addicting. I’ve heard (cuz like I said, still haven’t read it myself, but I’ve heard from others who have pretended to read it) that it’s so addicting that rehab clinics have now replaced methadone with abridged audio versions of my book narrated by Dr.Drew Pinksy. It seems like your book tour will never end, when it finally does come to a conclusion, what is next on your horizon? -Write an apology letter to everyone who read my book. I’ll be saying the phrase, “I’m sorry” more than Alec Trebek during a game of Celeb Jeopardy featuring Sarah Palin, Michelle Bachman, and Glenn Beck. So lemme start that long list now: “Sorry” to EACH, EVERY & ALL…two of you. I assume I have at least two readers all together, yeah probably two (that is-if I round up by three). Before this is immortalized on RoyalFlushMagazine.Com, you have anything to say? You better speak now or forever hold your peace! 1…Buy my book, “Meet Mr.J” written by Mr.J because all precedes go to charity. 2…Since you bought my book, I should be honest and tell ya that yes precedes went to charity but also forgot to mention that I just changed my name from Mr.J to “Charity” and I think it’s ironic that no one gave me my name “Charity”. 3…Finally, now that you’ve bought my book for a “Charity” that just changed it’s name back to “Mr.J”, I’d like to be humble, modest, and meek when I say: You’re welcome! You can pick up Mr. J’s book “Meet Mr. J” at Amazon.Com and you really should. Do you want this guy driving your cab, flipping your burgers, or even mowing your lawn? I didn’t think so. Go buy the book, alright?